I have always had an interest in travel and tourism and in 2015 after many years of bringing up my children I decided to return to education and enrolled on a level 3 course. 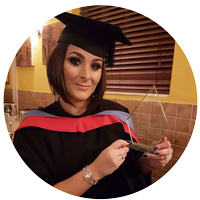 The support I had from the tutors at the college was fantastic and therefore continuing to stay with them for a further two years to do a HND was a perfect choice for me. Time management and confidence are two of the main skills I have developed during my studies. Juggling the workload and completing work to a high standard whilst running a busy family home and working part time has taught me the importance of having good time management skills, a skill which can be applied when in my chosen career. With regards to confidence this has been one of the skills I wanted to develop during my time at college. Through doing presentations, and speaking in class I have seen my confidence grow, and this was apparent during my recent graduation where i was invited on stage to deliver the Vote of Thanks, where i amazed myself! Confidence and speaking in front of others will be important in my chosen career if I plan to progress onto a management position within the travel industry. Whilst bringing up my children I have worked for my husband's business as an Account & Sales Manager. I have been able to do this part time whilst progressing with my studies. I have progressed onto The University of Chester Business School to top-up my diploma to a degree, and upon completion in summer 2019 I hope to gain employment in the tourism industry. My future plans would be a management position within a travel agency or a hotel. Since completing my HND I have also considered further down the line becoming a travel and tourism lecturer. There will be times during your learning when the workload will be heavy and you may struggle. During these times remember that your tutors are there to support you. They have a wealth of knowledge in your chosen field of study and they want you to do well and succeed. Know that during those difficult times they believe in you, and want to support you as much as they can, so don't be afraid of asking for help and build those relationships with them. I would like to personally thank Cheshire College South & West and the Travel & Tourism Department, for providing me with a fantastic experience whilst studying for a HND. Cheshire College South & West has given me an education, and it is my responsibility to continue my journey and to be able to apply the skills and knowledge learnt when faced with new situations and experiences.